Home Airline News How Does Livery Happen, The JetBlue Way? 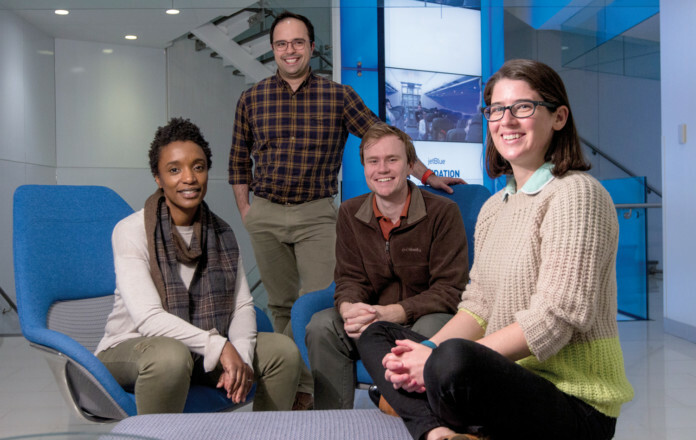 The JetBlue Brand Design team, (left to right): Lashonne Duncun, Joseph Paul, Christopher Thomas, and Ciara Cordasco. In January of 2004, a young woman who had a record of successes at several well-known magazines, joined JetBlue as a Graphic Designer. During that same period of time, a JetBlue aircraft landed in Fort Lauderdale from JFK with the CEO and founder of the airline, David Neeleman on board. Upon landing, he assisted fellow passengers with their luggage and then began clearing seat backs and picking up trash under the seats. That commitment to service; the rolling up one’s sleeves no matter their title, was a hallmark of this still growing and prospering company. And that culture remains today. The message of friendly service was a key success factor during Neeleman’s tenure, and the visual communication of that message, eventually became the responsibility of the young woman who was hired that day in 2004. The year 2004 was also the time the aviation community may have begun recognizing that JetBlue was a “keeper”. Open their books and you’ll find it hard to argue with that. While almost everyone else was awash in red ink, JetBlue was in the black. 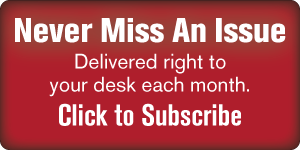 In 2002, the three-year-old airline logged a $55 million profit on revenues of $635 million. The 2003 earnings were expected to rise 42%. Since going public a little over a year, its market cap has grown to $1.7 billion, nearly as large as Delta, United, and American combined. Business is so good that he’s hiring an average of six new employees a day, and that year, he added 12 shiny new Airbus A320s to his current fleet of 41. 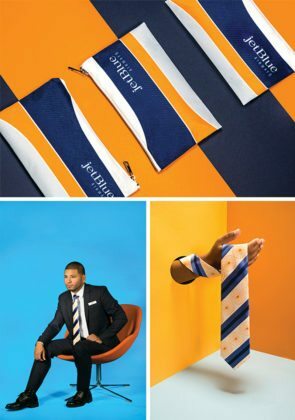 Going forward to 2017, the founding executive’s commitment to customer service has been a continuing theme in JetBlue’s corporate culture and is an integral part of their branding strategy. Through 3 CEO’s and a growth of staff from 8,000 in 2003 to over 20,000 in 2017, the message is unchanged. The branding strategy is also a basis for how JetBlue visualizes and incorporates their aircraft livery and collateral designs. The team that supports this mission is led by that same woman mentioned above; Lashonne Duncan-Kellar, who was subsequently promoted to Design Manager. The Brand Design team has grown from two members in 2004 to a team of eight that has been together for two years. For JetBlue’s Brand team, the visual design seamlessly compliments the in-house copywriting to create a style that’s instantly recognizable as JetBlue. 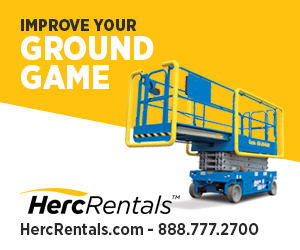 These assets can be seen anywhere from the largest liveries, to the simplest countertop placards or promotions on social media. If you track JetBlue’s livery designs chronologically, you can almost document a history of the company during those periods. The designs might represent partnerships with sports teams, incorporation of technologies such as WIFI, or the quirky “Blueprint” livery which is a complex thing of beauty. 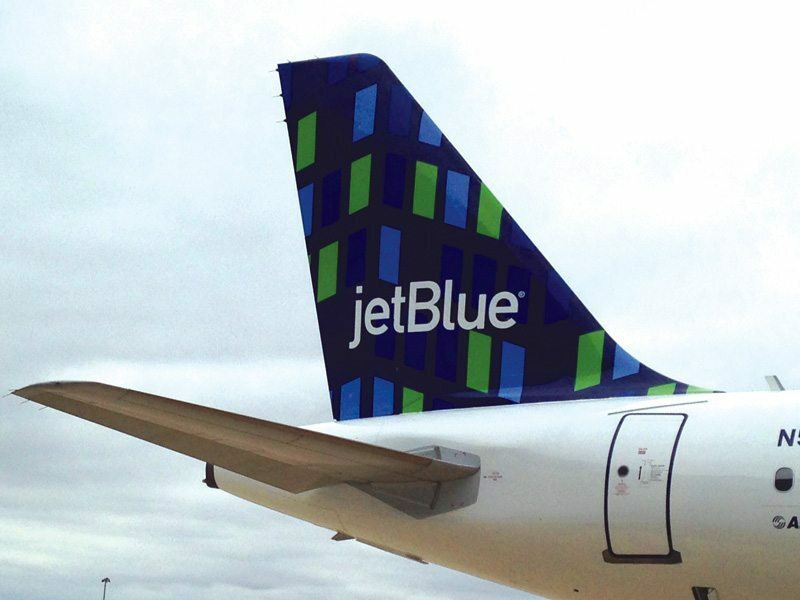 In February of this year, the “Highrise” pattern debuted at New York’s John F. Kennedy International Airport and will be added to additional aircraft this year across the JetBlue network, so customers can be on the lookout for the newest tailfin design in a city near them. The designers crafted Highrise, to celebrate its love affair with its’ hometown city. 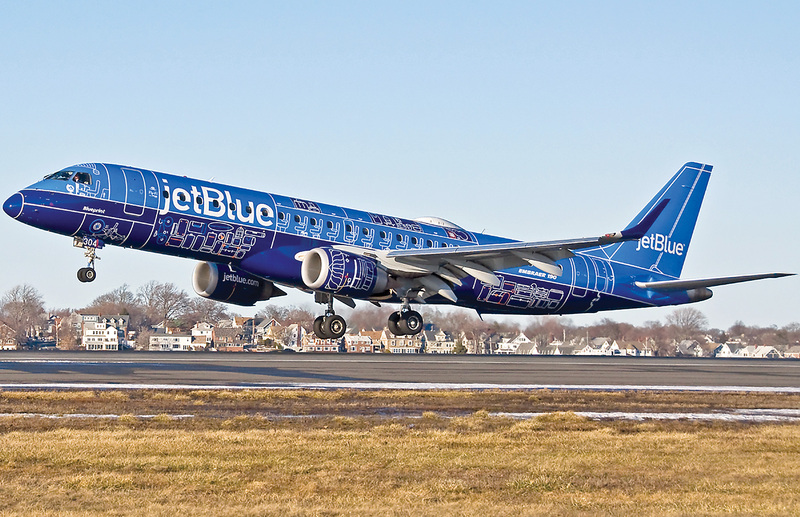 The design of livery is not simply an exercise in graphic design, but has to be coordinated with JetBlue’s, branding strategy, and also be in accordance with the aircraft’s fundamental color scheme. Some may think that these limiting factors are quite a hurdle to overcome; the need for artistic creativity versus the gravitational pull of corporate branding. But the Branding Design people have managed to craft some very nice to look at livery, and at the same time, support the airline’s mission. In a 2016 article in USA Today, the writers describe how the design team immersed themselves in “1960’s culture” on their way to creating the beautiful “Retrojet” livery. If I may be allowed some authorship privilege, I’ve always believed that livery was a tribute to the founding legacy airlines that preceded JetBlue. 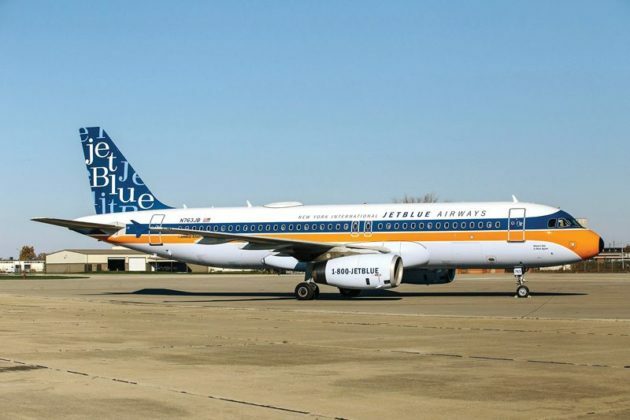 What’s Old is Blue Again: JetBlue’s 1960s-style retrojet. JetBlue’s 1960s-style vintage inspired Retrojet branding initiative. Highrise depicts the image of bright lights through window panes of city highrises, is meant to reflect JetBlue’s growth and New York’s perpetual desire to reach for the sky. Getting more current we arrive at the tail design livery of “Highrise”. How does such a simple design of multi-colored rectangles portray our great city? But it does. To me it’s the corner of a Manhattan apartment building at sunset, reflecting different tonal qualities, changing as you look again. Simple but powerful. It turns out the JetBlue motto, “You Above All” is not just some manufactured catchphrase after all. 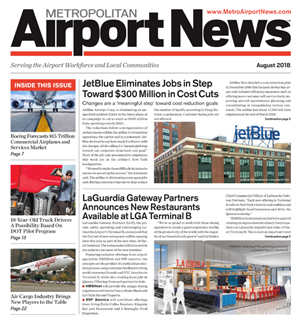 JetBlue and Alaska Airlines were identified as the top performing airline companies in the US for combined online and offline consumer conversations, according to a TotalSocial ranking released by Engagement Labs.